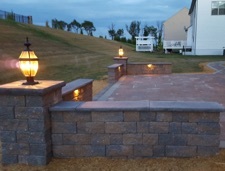 Landscaper serving parts of Maryland & Northern Virginia providing Landscape Contractor Service, Landscape Installation, Paver Patio Building & Garden Design. 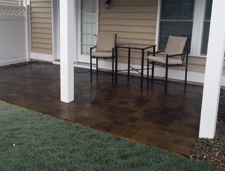 Washington & Frederick County • Lovettsville AND in Maryland we install landscaping in Clarksburg, Urbana, Middletown, Jefferson, Frederick, Boonsboro, Adamstown, Ballenger Creek, Keedysville, Clarksburg, Germantown,Sharpsburg, Hagerstown, Brunswick, Brunswick Crossing, New Market, Monrovia. Single Family Homes or Townhouse Patios and landscaping. Unique, Creative and Functional Outdoor Spaces. Specializing in Townhouse and Single Family Homes. We listen carefully to you and never pressure to up sell. Whether you have no idea of where to start, or if you have a specific vision in mind, we'll work closely with you to bring your project to life. Grasshopper wants you to enjoy your patio for years to come at a comfortable price. 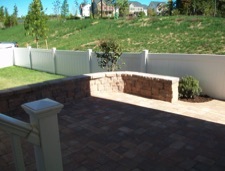 In that time we have designed and built hundreds of hardscape projects large and small. Over the years, we've purposely remained a smaller company. You'll aways find an owner on the jobsite building your project. Look to us for the experience, design, dedication, and know how to get your project completed.